E-Trio Automobiles, a Hyderabad based startup will soon launch electric vehicle conversion kits for conventionally powered cars in India. 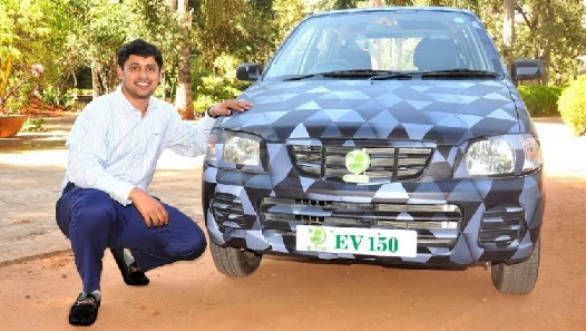 The company claims to be the first enterprise to have received ARAI approval for electric vehicle kits for the Maruti Suzuki Alto and Wagon R.
The company has been testing these kits for the last two years and aims to retrofit 5,000 units in the next year. It's factory is up and running and has the capacity to produce 1,000 units per month. The battery pack is being sourced from China while the controller unit is an in-house development. E-Trio is currently working under technological guidance from a Stanford alumni headed R and D team from SFO. The retrofitted Alto and Wagon R can run 150 km on a single charge. The company is also in discussions with other manufacturers from Japan and Thailand. These new cars will have a range of 210 km. Sathya Yalamanchili, the founder of the start-up, said that retrofitting is the way to go and need of the hour and these cars currently are the most efficient and economical cars compared to their counterparts in the market. The company's vision is to create e-mobility which inspires and nurtures pollution free India. Affordable range is the key to helping electro mobility achieve a breakthrough in the near future. Retrofitting, if done up to a proper standard, makes a lot of sense for a price-conscious market like India where the entry-price of EVs is a major hindrance to their take-up.